This is part of my How To Big Wall Climb project. Hans Florine tension traversing from the Muir Wall to The Nose during an ascent of Triple Direct on El Capitan. If you fall on traversing terrain you swing sideways, which is the most dangerous way to fall. On a vertical fall you almost always take the impact with your legs. On a sideways fall you usually take it on the abdomen or hip after you first impact with your hands. You are also more like to hit your head on a sideways fall. It's harder to bounce test on traversing terrain. You need to always be thinking about your follower and the need to leave gear and lower-out slings in convenient places for him. Ideally, you will have an 80-degree wall that is 30 to 80 feet tall and has one horizontal crack or bolt ladder and one diagonal crack or bolt ladder. I started in a tree that had a sturdy 20-foot-long horizontal branch. Another good option is a rafter that you can sling. Work with what you got. The important thing is to practice as much as possible. Pendulums are my favorite part of wall climbing. 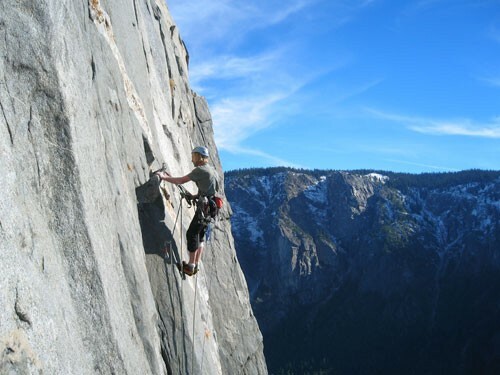 Nothing compares to running back and forth on El Cap with thousands of feet of air under you. Pendulums are also pretty simple: just lower, swing, and latch onto the next crack. What is tricky about them is what you do after the pendulum. It helps a lot to have sticky rubber approach shoes or free climbing shoes for pendulums. 1) Make sure your pendulum point is bomber. If it blows on you, you fall to your last piece. If it blows on the follower, the follower will take a dangerous swinging fall, probably onto their Ascenders, which can cut the rope. Back it up with gear if you are unsure of how bomber the pendulum point is. The follower can then decide for himself if he wants to leave gear or not. 2) Make sure there is a convenient way for the follower to lower off the pendulum point. If there is a sketchy lower-out sling, replace it with a good one. It is much easier for the leader to clean up the pendulum point than it is for the follower. When the follower gets up there the pendulum point will be weighted and harder to manage. 4) Swing over toward the crack or face hold you are going for. Usually on the first go you are too high so you will have to lower down a little. It's better to start too high than too low. If you are too low then you have to find a way to climb back up or, if the wall is blank, you have to jumar back up to the anchor point and start over. 5) If you are making a pendulum while free climbing, you can usually just swing, sink your hands into the crack, and start going. If you are penduluming to an aid placement, you should guess which piece of gear you need and put that on the end of your Aider. Once you reach the crack, you can then sink in the piece of gear and stand on it. 6) Once you are done with the pendulum, you either tell the belayer to give lots of slack in the rope by yelling “slack” or give slack slowly to ease the transition to the next move by yelling “lower slow.” Often if you are penduluming to free moves, you will want to have some tension for the first few free moves, so careful communicating with the belayer exactly how much slack or tension you want is essential. Shakopee MN and Thornton CO, U.S.A.
Opps I don't think the "12. Following 4: Traversing Terrain" is done yet. Oh well I will just wait for it. Great job so far I have just been skimming through it all before I actuly start with the check list. tx chris, i'm a fan of supertopo.com. you're doing a super job.